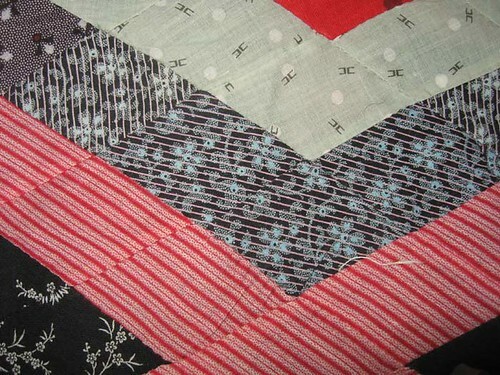 Antique 1880--1900 Diamonds Quilt Top, Unusual Construction. Please scroll down for larger photos. This top is entirely hand-pieced. I estimate that it was made in the last part of the 19th Century or first decade of 20th C at the latest. The maker of this top used an interesting method of piecing the diamonds; they are made of many smaller diamonds--not larger strips of fabric. I like the way the striped diamonds do not line up, but make an interesting pattern instead--much more interesting than if the maker had used bigger pieces of material! The colored blocks are carefully placed, but with a surprising variety of fabric. This has been washed at least once (not by me). The former owner has hacked out chunks for ? ?a craft project. I thought of evening off the lower edge, but decided to leave that to the buyer. It would still be a generous size even with the lower edge cut even--about 78 X 80. A few small holes here and there. Please study pictures carefully and ask questions before bidding. I looked at it and said, you know what? 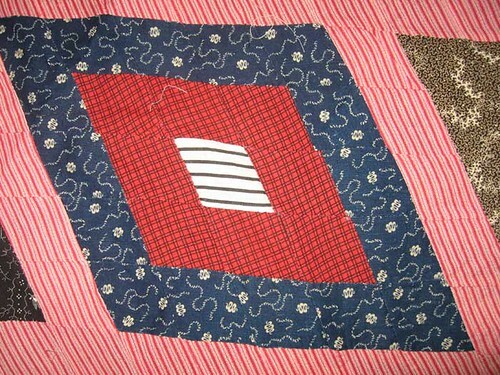 I love this pattern, and I can salvage this quilt top. My only question at this time is how closely I can match the striped double-pink fabric. 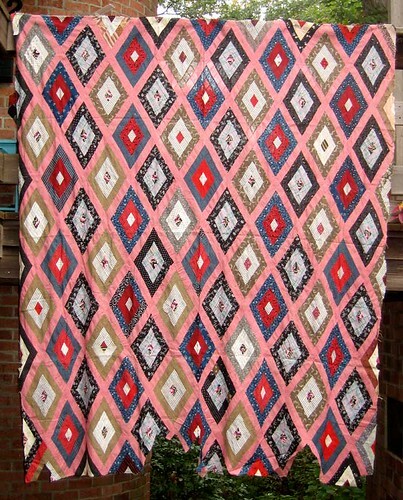 If I can do a close match to the double pink fabric, I could salvage the entire quilt with very little effort. I was so excited when I opened up the box and smelled the quilt top: old quilt tops feel different than modern quilts, and have a subtly different smell. I mentioned this to Amye when she and I talked about it; I don't know if it's the dyes or how the cotton was processed, but it feels different, looks different, smells different. It's delightful to me. It screams "I've been around a long, long time." I loved Amye's suggestion of calling it "Oregon Trail." The quilt dates to the right time period, and since she lives in Oregon, that's effectively the journey this quilt would make. It was the first suggested name I heard that felt right. 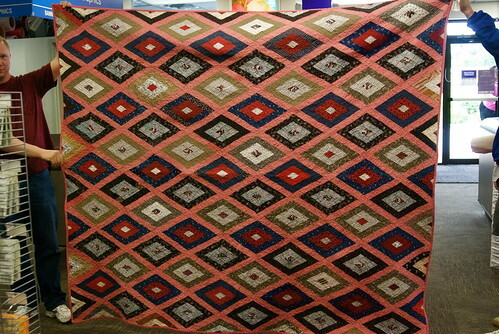 So ... well over a century after it was originally made, this quilt top is finally slated to get its day in the sun.